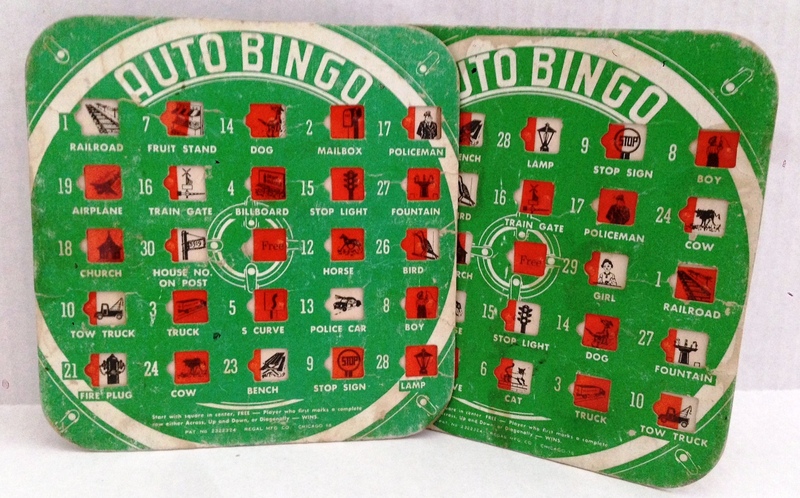 In the 1960s to early ’70s, my mother, sister, and I were living the cliché. Packed into a red Volkswagen Beetle, we took to the open roads snaking across the country from Hollywood, Florida to St. Louis, Missouri for our annual summer vacation. We stuffed the frunk (front trunk) with sturdy suitcases and bags full of mangoes, grapefruit, and avocados from our backyard that steadily ripened in the searing heat. The odor each morning was so repellent we had to air out the car before driving away from the motel. But once we got underway, the meandering back roads led us through quaint country towns like we never saw in Florida, over rolling farmland lush with summer crops, into one-radio-station no man’s lands where a farm auction or Paul Harvey was the only thing on, and to hours of charades, license plate games, car bingo, daydreams, and imagination. One and a half days into our 3-day odyssey, in Hardin, Kentucky, stood The Hitching Post & Old Country Store—an oasis of marvels with cool drinks to quench our thirst, a Conestoga wagon and stocks for fun photos, and shelves and shelves of trinkets and knick-knacks to mesmerize any child with an allowance to spend. But all those wonders paled in comparison to the mysteries of the grab bags heaped in a basket near the cash register. I was always enthralled by the unknown: Nancy Drew was my heroine and Adam West’s Batman was my muse (what could be more enigmatic than a superhero with his eyebrows on the outside of his mask?). So, I was instinctively drawn to those unmarked, brown packages. By the age of 8, I was a hard-core grab bagger. Picking each up in turn, I carefully weighed the pros and cons of every box. The long one could be a doll or maybe a necklace; the short one a smaller doll, earrings, or maybe a stuffed animal….such wonderful treasures danced in my imagination. As we pulled away from The Hitching Post, I’d open the box and peek inside. Of course it was never something as magical as a doll or a secret box. My mother, watching through the rear view mirror as tears rimmed my eyes, always had ready comfort: my father would like the reproduction antique bottles; the corn dish would be perfect for pickles and olives on the dinner table. One year, to my elation, I actually did discover a doll in the package, and back at home I added it to my collection. I now realize that it was one of those celluloid numbers with the glued-on clothes, creepy open-and-close eyes, and nightmarish haircut. 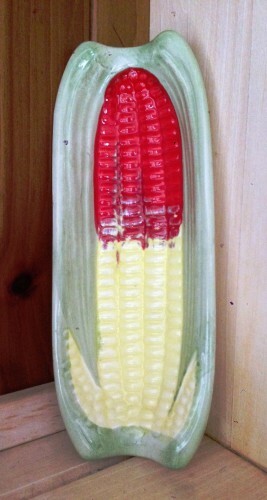 It is long gone, but the corn dish still stands on a shelf of my kitchen breakfront. Its shiny paint has not been faded by pickle or olive brine or from repeated washings. The rim has suffered no chips. In fact, the dish may only have been used once or twice—that first summer. But the corn dish is one of my favorite possessions. For me it symbolizes many things—and what kind of reader/writer would I be if I did not find symbolism in even the most common household objects? And the corn dish? For me it symbolizes persistence in the face of disappointment (the life blood of any hopeful writer), longevity, compassion, idealism, hope, and humor. I joke with my kids that the corn dish will one day be their inheritance, but really I couldn’t wish to hand down a better heirloom.